Whether you want to follow the 'new year, new you' mantra or not, some spring cleaning and minimalism could lead to less stress and more success in 2018. By getting rid of or donating unnecessary items, you’ll be harmonising your home and ultimately your life. For some reason we feel the need to keep old bed linen, pillows, towels and tablecloths –just in case! But worn out and past its prime linen is only good for the donation pile, for animal shelters or to be shredded and reused. You’d be surprised at how much new storage space this could create! It was just a phase –you'll probably never wear those garish hooped earrings again! We often struggle parting with old clothes and jewellery, but clearing out old fashion trend pieces makes more room for new things and timeless classics. 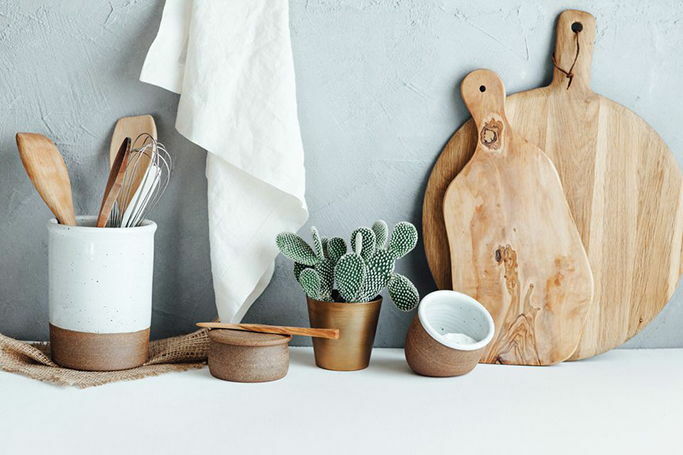 Although it sounds obvious, many of us don’t clear out our kitchen cupboards with packets and jars that are years out of date taking up our valuable space. From spices, to protein powders, odd condiments and random bottles, your kitchen needs its own declutter and you need to stop hoarding sauces you can no longer eat! Not your nice wooden hangers that keep your clothes organised and fresh! We’re talking about broken hangers you’ve left to linger, wire hangers that you probably got for free and the ones that your clothes slip off of, as you end up with a pile of clothes you didn’t want to sort. Get rid and replace if need be. Whilst you're in the wardrobe maybe it's time to let go of those shoes you could never walk in and that jumper with a hole in!! If it expired in 2013, it should no longer be in your bathroom cabinet! From makeup to sunscreen and old perfumes, there are many things we keep and no longer need. It is good for both your skin and your home, to declutter and cleanse from items that may only cause you harm! We’re all guilty of keeping old cards and scraps of paper for their sentiment, but maybe 2018 is the year to let go. From bills to newspapers and old business cards, paper can take up a lot more space than you’d think and is there really any need to keep it?! The same goes to product packaging and boxes, it may have looked pretty but it now clutters your home! Plastic containers with missing lids, chipped mugs and mismatching cutlery, it all has to go. The utensils you’ve never used and never will, the Christmas presents you didn’t want anyway and all things you have double of, they can go as well. A kitchen with less in it is definitely more, as it’s easier to keep clean and cook in! Books can make an interesting feature and are often used in home decorations, however you don’t still need your school textbook you forgot to return or the self-help book that didn’t work (probably because you never read it). Libraries will be happily accept your old books and you can clear the coffee table from its unwanted clutter.